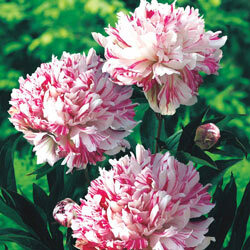 Peonies have long been a springtime must-have, sometimes lasting an entire lifetime in the garden. 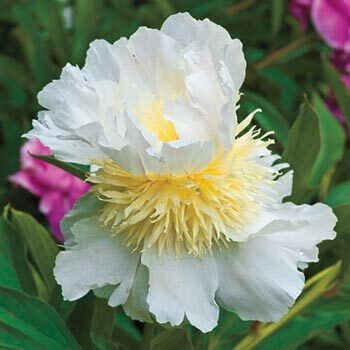 Top Brass Peony is simply perfection with its large, shimmering white blooms delicately touched with soft pink and pale yellow. As the flowers mature, they take on more of the pink or yellow hues, giving a unique twist to this classic favorite. Peonies are fairly carefree and require only minimal maintenance during their first year. A light mulch during the first winter is suggested. Prefers well-drained soil. Large, fluffy blooms of white, streaked with raspberry red, appear in late spring. These Japanese gems are perfect for borders, entryways and foundations, with mounds of glossy, deep green ornamental foliage throughout the season. 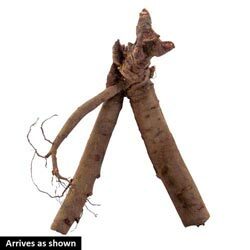 24-36" tall. Peonies are stalwarts in the garden, long-lived, easy to grow, and beautiful. They have few requirements: give them a sunny well-drained location, plant 2-4' apart, with the eyes (new buds at the crown) no more than 2" below soil level and apply fertilizer or compost in spring. They take a while to establish, often 3 years before first bloom. Germination Plant with eyes 2" below soil surface. Planting too deep will result in poor flowering.